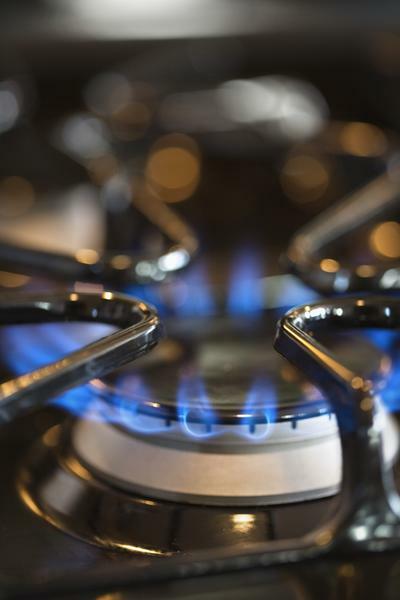 Gas ovens, whether powered by natural gas or liquid propane, have relatively low operating costs and are capable of cooking foods both quickly at high temperatures and slowly at low temperatures. Any food capable of cooking in an electric oven or stove can cook just as well in a gas oven or stove as long as you understand how to properly use it. Gas stoves cook similarly to their electric counterparts, but typically, gas stoves heat more rapidly and maintain a more consistent heat. You also can use the flame on a gas stove-top for charring ingredients like peppers, something electric can’t offer. Gas stoves give off more heat and smell than electric stoves, so maintain good ventilation with a fan or window when necessary. Be patient when first learning how to adjust the flame on your stove since many individuals have a harder time controlling gas heat than electric heat. Place your pot or pan on the burner and turn the control knob to ignite the burner. Adjust the flame size so the flame hugs the bottom of the pan without sneaking up the sides. Liquid cooking methods, including boiling and stir-frying, work better on a gas stove than dry heat methods, like sautéing. Liquid keeps the heat evenly distributed while dry heating causes some spots on the pan to cook hotter than others. Quick stir-fried meals use bite-size pieces of chicken or other meat, fresh or frozen vegetables, and pre-made sauces. Easy boiled foods include spaghetti and other pastas. Allow your gas oven to preheat five to ten minutes before baking, especially for sensitive baked goods like breads and cookies. Baked dinner entrées, such as casseroles and meat dishes, require less precise preheating in a gas oven, but any food baked in a non-preheated oven must cook longer than indicated on the original recipe. Since baking relies on the oven’s bottom heating element, avoid crowding the lower rack when you have food cooking on a higher rack. If your food consistently burns on the bottom, spread a layer of aluminum foil on the bottom rack to reduce burning. Broiling cooks food quickly at a high temperature. Conventional gas broilers cook food by exposing it to direct heat from a gas-powered flame. Choose a tender cut of meat, like tenderloin steaks or boneless chops, for best results. Less-tender cuts, like top round steaks, benefit from marinating six to 24 hours prior to broiling. Thaw meats in the refrigerator, but then bring to room temperature before cooking to ensure better browning. Trim excess fat from meat and place in the broiling pan. For medium doneness, place food closer to the flame. For well-done, place food further from the flame and cook longer.